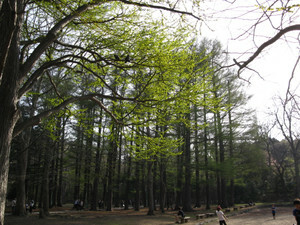 Located just walking distance from the school, the Maruyama Park (Koen) is a place where I am rather attached to. With scenery that changes with the season, you can be guarantee to discover new things whichever season you go. With autumn just on our doorstep, it is the perfect place to go for a walk when the weather turns from humid and hot to cooling and agreeable. Maruyama Park is transformed when the leaves change colours as autumn progresses. Besides the autumn tints, you can also hear birds' chirping echoed through the park, especially in the morning. Taking a deep breath of fresh air, one would feel extremely fortunate to be able to have easy access to this park. For photo lovers, do not forget to bring your camera whenever you visit Maruyama. Just next to the park, is the Hokkaido Shinto Temple or Hokkaido Jinguu as the locals call it. 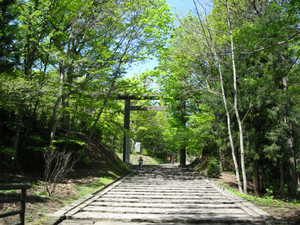 Access is easy from the Maruyama Park and all you need to do is to follow the signs which will lead you to the temple. If you have the privilege to live in or visit Japan, visiting the Shinto temple is, in my opinion, a must. After you pay your respect to God (Kamisama), it is recommended that you stop by the cafe located within the Shinto temple compound where you can enjoy one free mochi (Japanese sweet glutinous rice cake) with tea courtesy of one of the famous confectionery companies based here in Hokkaido. Visitors from all over the world come to visit Hokkaido Jinguu and you might be able to meet some of them at this cafe. Sometimes you might even catch someone speaking in a language that is familiar to you and reminds you of home.